NEC, SMUD and SpaceTime began their partnership (note 1) in 2015. To date, the three companies have been collaborating in co-innovation, development and commercialization of smart energy technologies and services targeting electric customers in Japan, Asia Pacific and the US market. 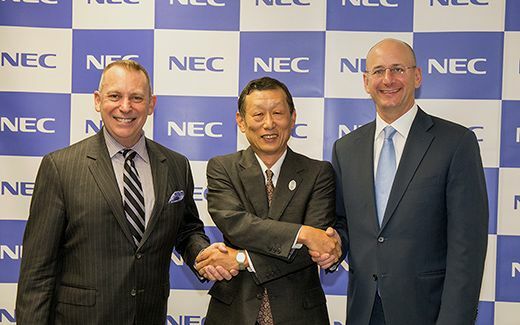 The partnership relies on the unique combination of NEC's advanced technology capabilities and vast business experience in IT system development for Japanese electric power companies; SMUD's industry-leading expertise in public power electric utility operations, customer service, innovation and environmental leadership; and SpaceTime's analytics and visualization application package, which has been successfully implemented by major electric power companies in North America. In its first stage, the partnership will offer electric power providers in Japan an advanced asset analytics solution that will enable power providers to achieve higher levels of operational efficiency. Additionally, the partnership will offer emerging retail energy providers bundled smart energy products, services and solutions that give customers more control over their energy use and more opportunities to save money. In later stages, the partnership will provide services to businesses in APAC and other global markets. The three companies will collaborate on the development of new technologies that are expected to drive multiple operational efficiencies and optimize business model transformations for electric power companies throughout the world. "By combining the technology and expertise of leaders in three industries, we're providing a suite of solutions that will immediately be best in class," said SMUD CEO and General Manager Arlen Orchard. "We're confident this new partnership will provide a very valuable service to electric power providers throughout the world." "Machine learning and advanced analytics, driven by the data supplied by IoT applications, are changing the way industries run their operations," said Rob Schilling, CEO of SpaceTime Insight. "Our analytics, informed by SMUD's deep experience and embedded in NEC solutions, will drive the next generation of solutions for the global utility sector." "Through this innovative partnership, combining NEC's advanced ICT technology, SMUD's energy business know-how and SpaceTime's proven analytic and visualization application, NEC can provide new smart energy solutions for electric power companies and realize our vision of creating new social value," said Kazuhiro Takada, Executive Vice President of NEC. As the sixth-largest community-owned electric service provider in the United States, SMUD has been providing low-cost, reliable electricity for about 70 years to Sacramento County and small adjoining portions of Placer and Yolo Counties. SMUD is a recognized industry leader and award winner for its innovative energy efficiency programs, renewable power technologies, and for its sustainable solutions for a healthier environment. SMUD's power mix is about 50 percent non-carbon emitting. For more information, visit smud.org. SpaceTime helps asset-intensive organizations generate more value from their people, processes, and assets. Their machine learning analytics and IIoT applications optimize operations in motion, in context and in real time. Some of the largest organizations in the world in transportation, energy, and utilities, including SMUD, use SpaceTime Insight software. NEC and SpaceTime began a partnership in the smart energy business in 2014 and are now enhancing their business successes in Japan and the APAC region (note 2).